"Planning" is the next big step up from basic starting hand selection when it comes to preflop strategy. Starting hand selection = choosing to play hands that are generally profitable from certain positions. Planning = thinking about all the possible outcomes of different plays based on your starting hand, players left to act after you, logical reactions from them (and how you'd react to those), and position... then making the play with the set of greatest +EV outcomes. Planning obviously takes a bit more effort than straightforward starting hand selection, but that's why it's a more profitable approach to preflop play. Furthermore, with practice the entire process will become instinctive anyway. Preflop planning is basically a more advanced (and more profitable) form of starting hand selection. So instead of just looking at your cards and position, preflop planning includes thinking about how the hand could play out in different situations, and whether you can profit from those situations. You could just call it "thinking ahead", but hand planning and preflop planning are the more commonly used terms. Although this is titled as Preflop Planning, this video could easily be described as a video guide to playing before the flop in Texas Hold'em. SplitSuit covers all aspects of preflop strategy, including; opening, cold calling, set mining, raising, 3betting, 4betting, and there's even a dash of 5betting. All of these topics are covered using actual hand histories in the hand replayer. Example of a decision tree that SplitSuit uses when working out whether to fold or raise. (3:14) Example 1 - 44 in EP. 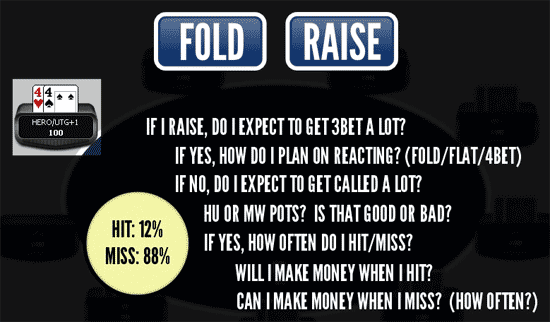 Deciding whether to raise, call or fold. (7:53) Example 2 - Isolating with AJo in MP. (26:32) Example 1 - Outright profit - 3betting with J9s from CO vs MP1 raiser.